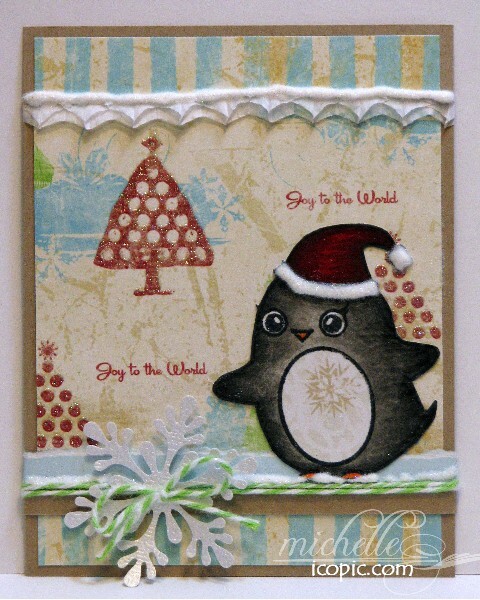 Today's card cute image from SP & Co. I stamped the image on a piece of coordinating designer paper and then colored all but the penguin's tummy with Copic markers. Copic Colors: W7, W5, W3, W1, R89, R29, YR04. I used glitter accented designer papers from Dovercraft's Let It Snow Collection and used a touch of Divine Twine to embellish my card. Darling card. Love that penguin!!! So adorable! I love the icicles and the penguin is adorable. The twine is great, too. Oh my heck. That penguin is adorable and colored so well. I might *need* that penguin since I love penguins (and collect them)!